Let yourself go free in summer! You can enjoy hiking, mountain biking and riding, why should you still drive your car? With the Holiday Pass, you will receive for free, you can confidently leave your car for the duration of your holiday at the Maurlechnof. The non-cash mobile card allows you to use public transport, including the regional trains throughout South Tyrol for free. So you will save fuel costs, relieve incidentally the environment and are comfortable anywhere on the go. 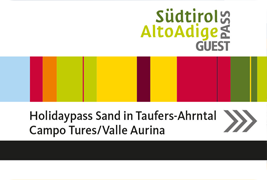 With the Holiday Pass you can get to know our beautiful Ahrn valley, reach the starting point of many tours, can take a bus to come back after a long bike ride or explore other Tyrolean regions and our cities.